Fuel spray is dangerous. Fuel can burn skin and eyes and cause illness if ingested. Fuel spray is released when there is pressure in the fuel tank and the fuel-filler cap is removed too quickly. Fuel vapor is dangerous. It could be ignited by sparks or flames causing serious burns and injuries. Additionally, use of the incorrect fuelfiller cap or not using a fuel-filler cap may result in fuel leak, which could result in serious burns or death in an accident. (U.S.A. and Canada) Always use only a genuine Mazda fuel-filler cap or an approved equivalent, available at an Authorized Mazda Dealer. The wrong cap can result in a serious malfunction of the fuel and emission control systems. It may also cause the check engine light in the instrument cluster to illuminate. 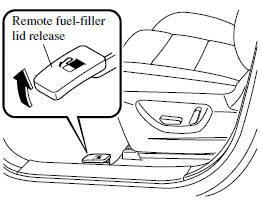 To open, pull the remote fuel-filler lid release. To remove the fuel-filler cap, turn it counterclockwise. Attach the removed cap to the inner side of the fuel lid. To close the fuel-filler cap, turn it clockwise until a click is heard. 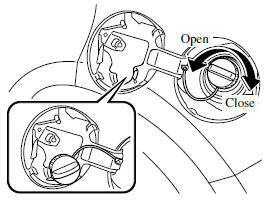 (U.S.A. and Canada) If the check fuel cap warning light illuminates, the fuel-filler cap may not be properly installed. If the warning light illuminates, park your vehicle safely off the right-of-way, remove the fuel-filler cap and reinstall it correctly. After the cap has been correctly installed, the fuel cap warning light may continue to illuminate until a number of driving cycles have been completed. A drive cycle consists of starting the engine (after four or more hours with the engine off) and driving the vehicle on city and highway roads. Continuing to drive with the check fuel cap warning light illuminated could cause the check engine light to illuminate as well.